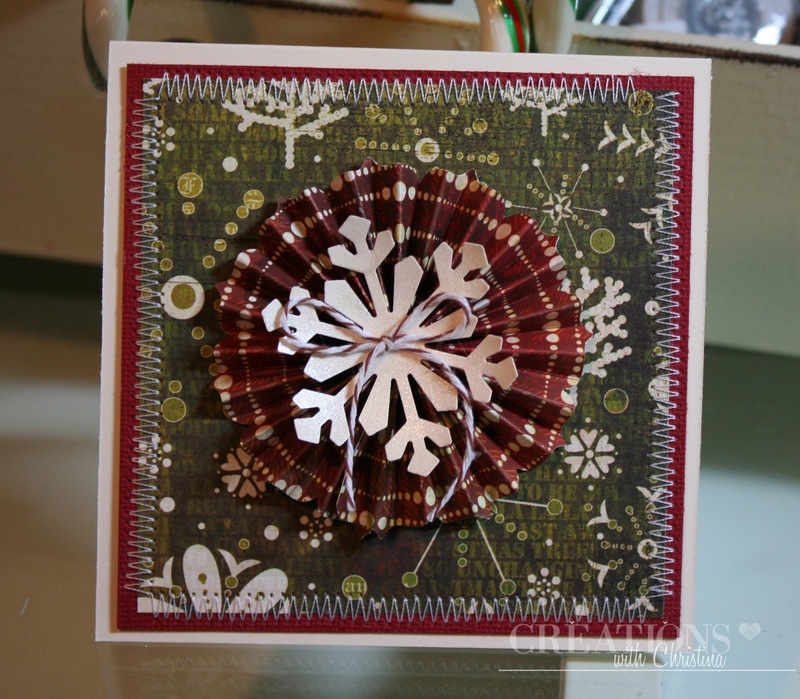 Today I have a Christmas card that I'll be sending out to a few of my crafting friends...I love making my own rosettes. (See my tutorial HERE). Supplies: Basic Grey Jovial Collection, Fiskars Punch, Martha Stewart Scor Board, Martha Stewart Large Snowflake Punch, Martha Stewart Bakers twine, Red Core'dinations cardstock, Ivory cardstock, Lindy Stamp Gang Scintillating Silver Glitz, Misc Sewing. Just wanted to let you know that I'm taking a little holiday break from videos (but not posting) and will be back in the new year with lots of fun videos. 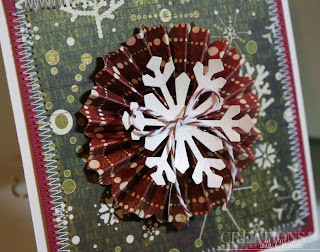 What a great idea for a christmas card and the snowflake in the middle just finishes it of perfectly. 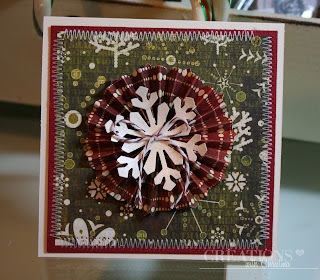 Love your rosette and the pretty card! I think the rosettes are really fun to make and are neat decorations (especially on a Christmas Tree!) I like to punch the edges with a border punch before I fold them - it gives them a really cool finished effect! Thanks for sharing! Hugs! Love it I watched the video again. Thanks so much for posting it again. I love this card. I may have to copy it for my thank you cards. I've seen a number of these rosettes and some crafters use large ribbons on their cards. My question: How do you mail them? I wish you and your family a very Merry Christmas and a Happy New Year. Thank you for sharing your talent and your time with all of us. Great look for the card. It gives it a wow factor with lots of dimension. Thanks for showing us. Have a wonderful, relaxing Holiday season Christina. Thank you so much for sharing your wealth of knowledge! Elegent card. I love those rosettes...but mine tear at the edges. Maybe you can give me some pointers. Have a great holiday and thanks for a great year of videos. MERRY CHRISTMAS! Great Idea for an ornament too with the snowflake! Thankis for sharing, and Merry Merry Christmas to you and your family! I am sure your friends will love these cards. I like the combination of paper and sewing.